I noticed a few interesting changes in the Pittsburgh area last weekend. Oh, look! It’s a “whatever, just don’t pee on the seat” bathroom! I confess I didn’t mind the fact that my buttocks touched the same plastic that had been touched by woman buttocks, boy buttocks, trans buttocks, republican buttocks, anarchist buttocks, socialist buttocks or any other buttocks. It’s pretty amazing. The people of North Carolina could learn a thing or two from some of the people in Pennsylvania. 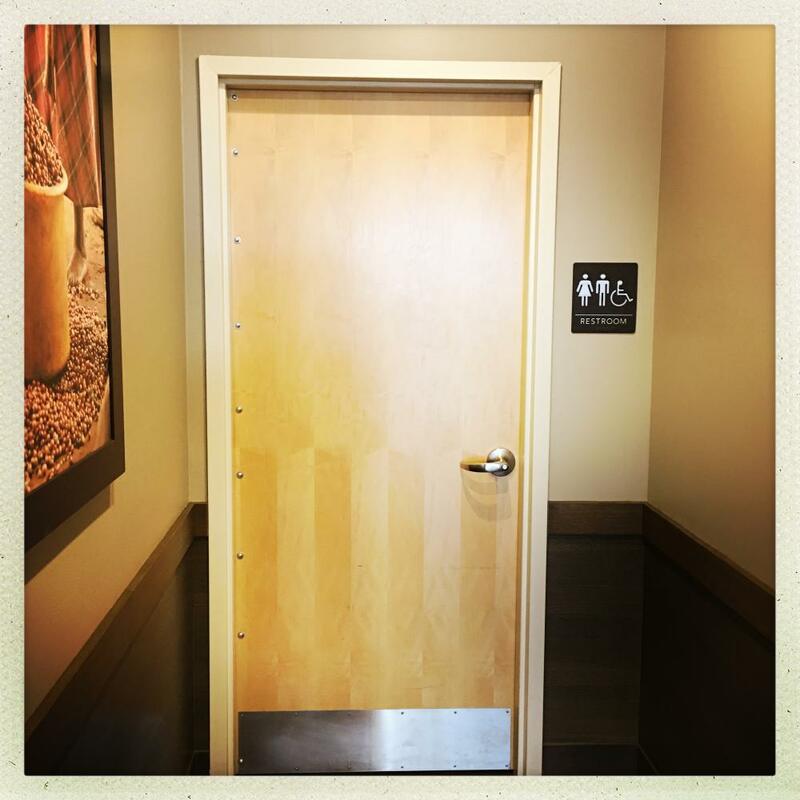 The Starbucks at Monroeville, by the WAL-MART, it’s also got buttock-neutral bathrooms. And they’re nice and clean with no pee on the seat. That’s probably because law-makers aren’t using them. I’m kidding. I know what that’s for. They appear to offer field expedient battlefield dressings. Did you know that sanitary napkins are pretty good for wrapping minor samurai sword-wounds … ? They work surprisingly well, they’re sterile and they don’t stick like towels do. 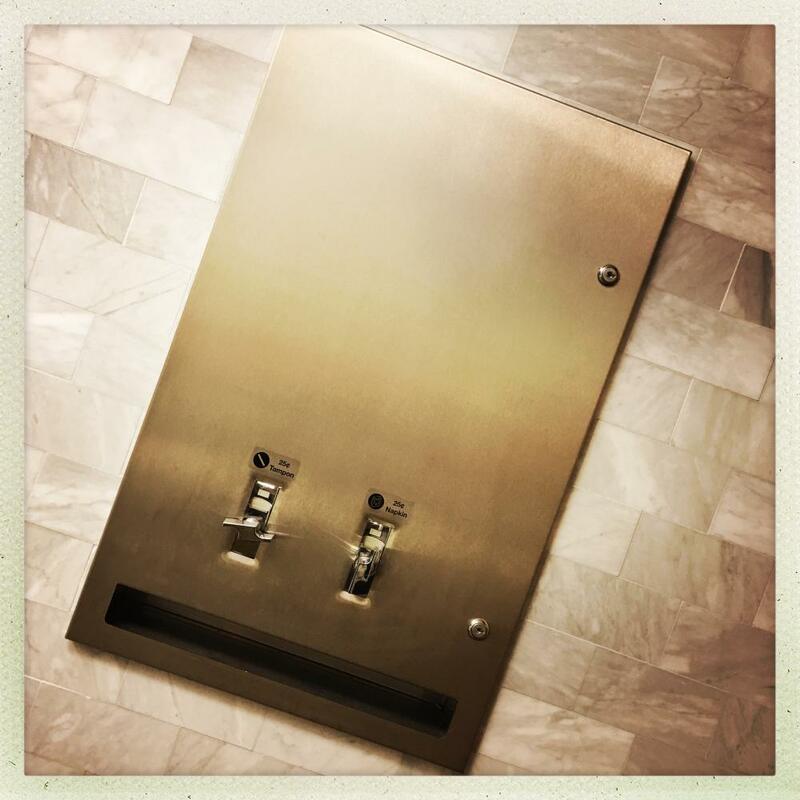 In fairness, I realize that the “issue” in North Carolina is not transitive buttock contact, or a glimpse of a napkin dispenser, it’s that someone might stare at someone’s stuff while they’re using the bathroom, and think prurient thoughts. If you’ve got a catholic priest or a megachurch pastor in the bathroom with you, I guess that can be an issue. Wait ’till they leave and whatever you do, don’t pee on the seat. So why, in the 2nd photo, does the artwork immediately outside the door depict an abundantly overflowing container, huh? Not only does it say restroom, but also the same with Braille. I wonder if the Braille has an indication as to whether it’s gendered restroom or not. There must be different markings, one would assume. 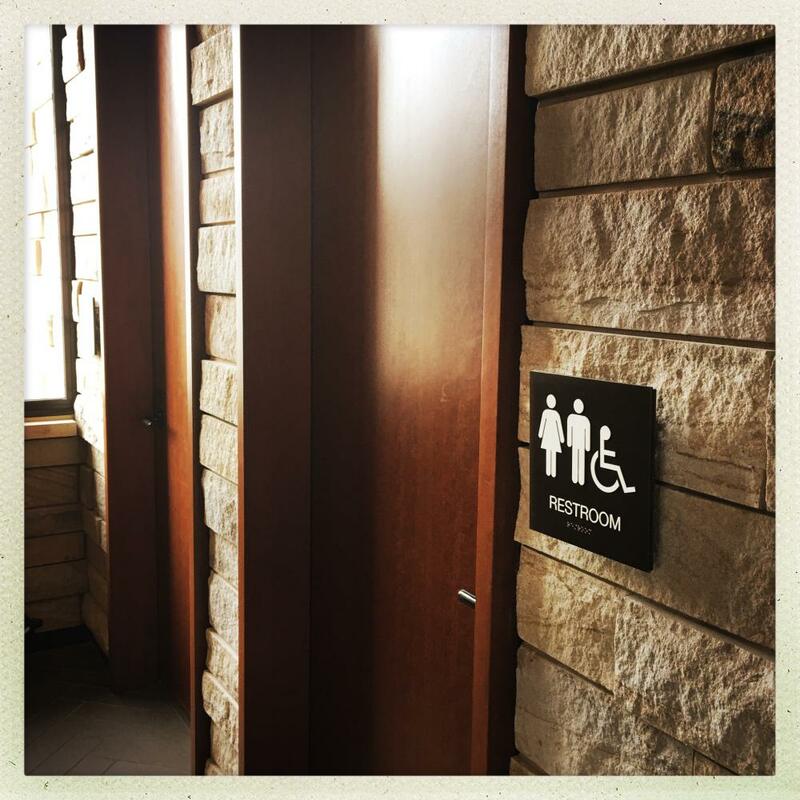 Otherwise the North Carolina legislators would be up in arms about people pretending to be blind so they could go into the bathroom and see little boys using the urinal. I confess I didn’t mind the fact that my buttocks touched the same plastic that had been touched by woman buttocks, boy buttocks, trans buttocks, republican buttocks, anarchist buttocks, socialist buttocks or any other buttocks. The first photo seemed strange. I am not sure how to put it but we would just have a some sort of symbol saying washroom.